Well, I've been in crafting/creating mode off and on for the last couple of weeks, getting ready for this July release from REVERSE CONFETTI. Let me tell y'all, I've had the MOST FUN creating with these new products this month! Over the next few days, I have 7 cards to share that show off 7 new stamp sets, 11 new Confetti Cuts sets, a new 6x6 paper pad, and 16, YES SIXTEEN new inkpad colors (that also come in the small cubes and reinkers). So anyway, let's snap to it and get this show on the road! 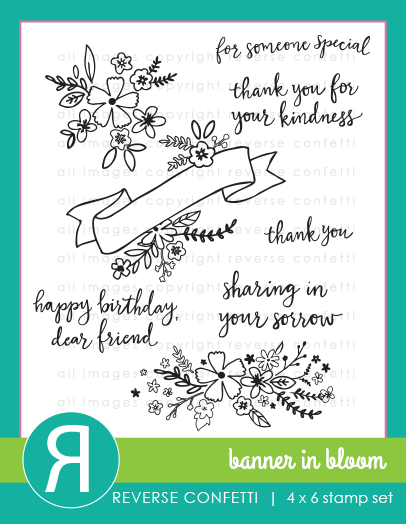 Today we are introducing 3 different stamp sets and their coordinating dies, one of which is called BANNERS IN BLOOM and the BANNERS IN BLOOM Confetti Cuts. You may also see something else new here! 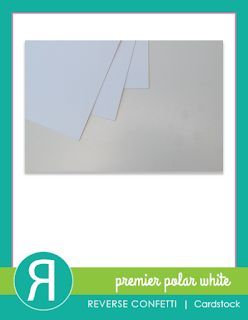 Oh and y'all, I'm SUPER EXCITED to share a new smooth white cardstock we will carry called PREMIER POLAR WHITE that is so perfect for Copics and solid images (100lb). You'll definitely want to give it a try! 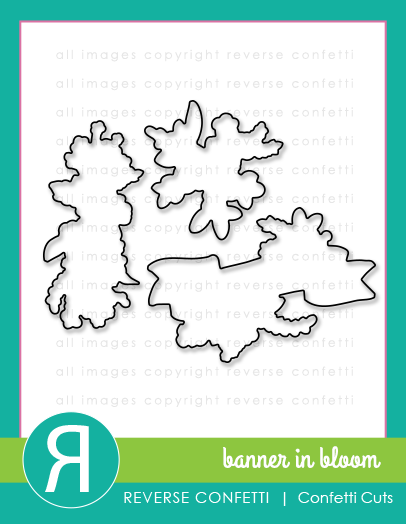 BANNERS IN BLOOM is a beautiful new floral set, perfect for minimal coloring, watercoloring or adding as much detail as you want! I chose to use one of my new favorite mediums, watercolor pencils (from Adornit--they are the BEST!) this time. I'm really still learning with them, but the blues just spoke to me for this banner. 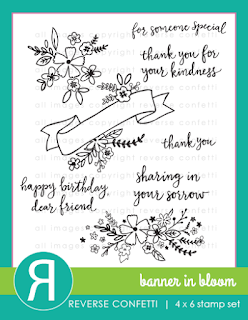 A few of the sentiments from the BANNERS IN BLOOM set fit perfectly inside the floral adorned banner, whereas others are also a great addition to your cards and can be used with the other floral sprays in the set. The backdrop for my focal point is something new as well. 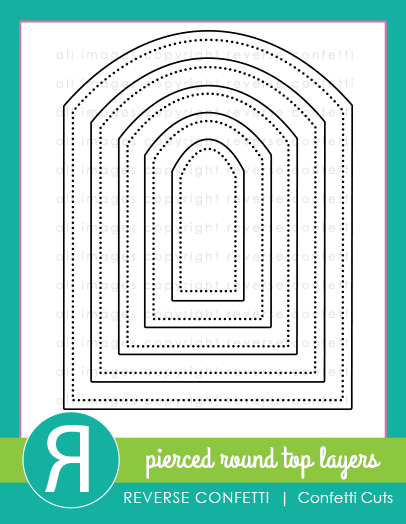 It's a new die set that I literally cannot put down--the PIERCED ROUND TOP LAYERS. For this card, I cut a larger one in black and the next smaller size from some older RC patterned paper before adding the main images and a TON of ribbons, embellishments and swarovski crystals. More is MORE, right? Wow. These banners are the best one with creative and attractive look. I would like to appreciate you for sharing these. Wonderful in blue... The paper pack and the polar white cardstock are on my list so far. The build a florals are pretty special also. Lots to ponder. Thanks for sharing. Your card is so pretty. Love the BLUE! Love the papers and matching inks! Love the papers and matching inks! Beautiful card! new products used today. Also love that gorgeous seam binding bow and lace you used; adds such a feminine touch to an already lovely card. That is one crazy fun card-love it! Thanks for the inspiration and showcasing the new 'stuff". Plenty of flowers, that's for sure! 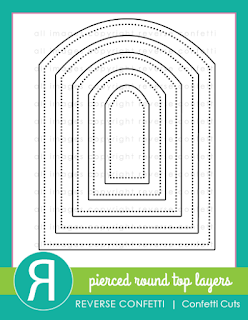 Loving the pierced round top dies and the squares cover die. Soooooo pretty!!! You do amazing creations!! Very pretty color combo and I like the layers and the button/bow. Sweet and lovely, admiring the round top pierced layer and the wavy edge. Your use of blue is terrific! Your card is simply amazing!! Gotta love those pierced tags!! Wonderful release Susan!! Love this mix of patterns and die cuts. I love that Reverse Confetti makes patterned paper! Very pretty! I love the colors and your design!! LOVE your card! This new release is so amazing and it's only day #1! I like your card!!! I hope we make it on July 11th at The Little Blue House class! Gorgeous card. the details are so gorgeous. what a great idea for colors! great job! Your card is very different and lovely from the rest of the cards! Gorgeous layering on this beautiful card! Lovely colors! How pretty! and I love that you used a button and ribbon too - I always forget about these and they really finish your gorgeous colorful card off perfectly! Thanks for the inspiration!